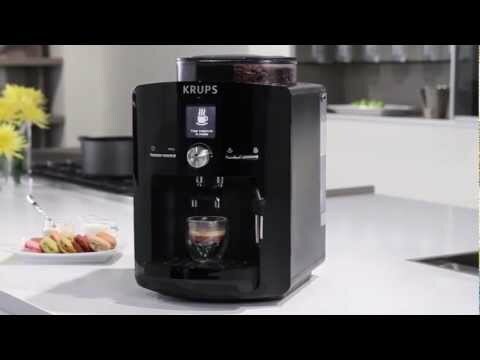 The Espressaria super automatic espresso machine by Krups is the perfect addition to any modern kitchen. This machine features an adjustable 9. 7 ounce bean hopper with stainless steel burr grinders that can be adjusted between three fineness settings. It also features a thermoblock heating system for a quick heat-up and perfect water temperature from the very first cup. You can adjust both the strength and size of each drink for a custom coffee experience suited to your taste, and the Espressaria uses a pre-soak system to moisten your coffee grinds before brewing for maximum flavor extraction. The easy to read LCD display makes setting up the machine and choosing your drinks simple and easy. The large capacity water tank includes a Claris water filtration system for purer tasting coffee and less frequent descaling of your machine. The machine also has a multi-directional steam nozzle that allows you to create perfectly frothed milk right in your cup. It also comes with the Krups Auto-Cappuccino set which includes a stainless steel milk container, tubing and special frothing head with latte and cappuccino settings. Also featured on this machine is an adjustable coffee spout (up to 4 inches) for splash free coffee preparation and a hot water function for brewing other hot drinks like tea. Cleaning this machine is easy thanks to the automated cleaning and descaling cycles, as well as the built-in cleaning guide on the side of the machine. This unit has a programmable clock that can be set with an auto on and auto off function to conserve energy. This Krups product is warranted for 2 years from the date of purchase against defects in material and workmanship.